We've been in a food rut in our house lately. And by food rut, I mean pizza rut. So, I broke out the slow cooker today to try something different. Right up front, let's get the disclaimer out of the way: this isn't authentic mole. 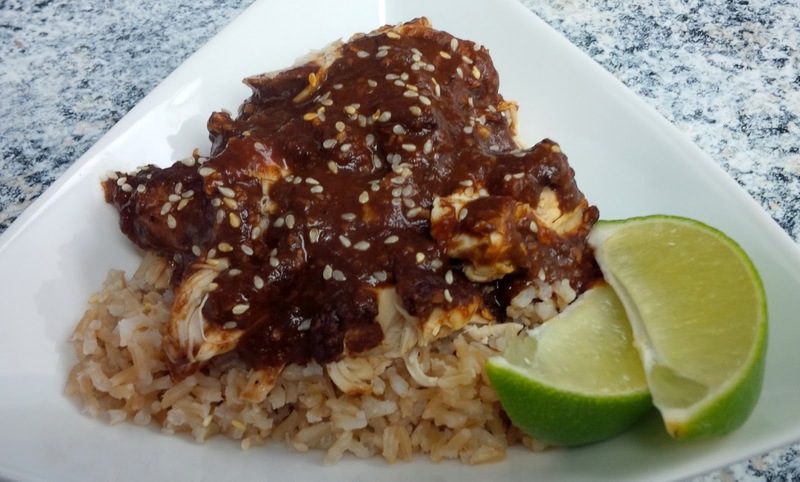 There are a number of regional varieties of mole in Mexico, but they do have some common elements, like chilis, dried fruit, thickeners (nuts or seeds), and often chocolate. Traditionally, the dish takes ages to prepare--roasting, soaking, blending, and cooking a lengthy list of specialty ingredients. So, yes. I cheated. I cheated and it was delicious. AND I got to use my slow cooker. I based my dish on the Biggest Book of Slow Cooker Recipes from Better Homes and Gardens. I did make a few changes, though. Here's my version . . . In a food processor, I blended the first 11 ingredients (through salt) to a smooth puree. Then I sprinkled the tapioca in the bottom of my slow cooker insert; it acts as a thickener. I poured in about 1/3 of the sauce, nestled the chicken breasts in, then topped with the rest of the sauce. I cooked the chicken on LOW for about 6 hours, until the meat was falling apart. If you use bone-in chicken, you'll probably want to let it go for more like 8 hours. I served the chicken and sauce over hot rice, with a squeeze of fresh lime on top. I would like to try this mole with a tomatillo blended into the sauce for a little bit of sour. But overall, I thought this was a good first attempt at mole, especially since I didn't have to work all day to get it! Be creative and enjoy!